Modern Living. 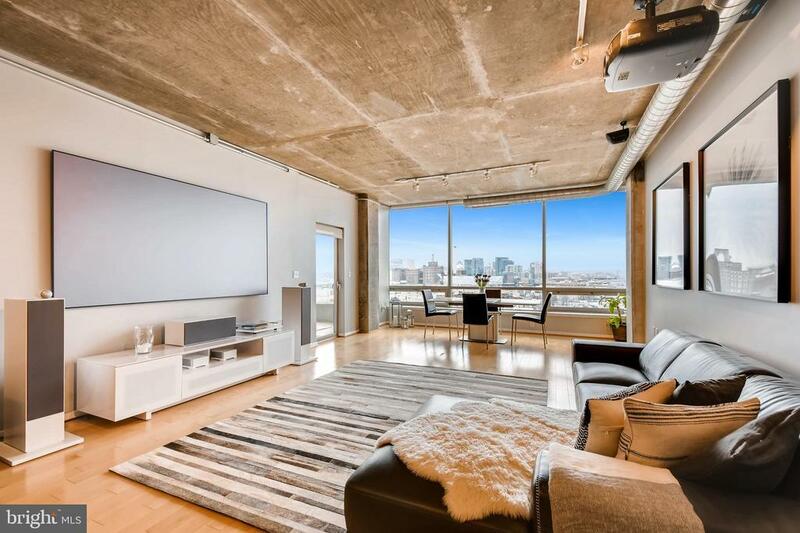 Spacious one bedroom, one and a half bath Silo Point condo offers sweeping water and city skyline views. This expansive open floor plan features floor-to-ceiling windows, 9 ft+ ceilings, maple hardwood floors through-out, surround sound, a custom designed European style kitchen equipped with quartz marble countertops, upgraded stainless steel appliances, tile backsplash, under mount cabinet lighting and built-in bar with wine & beverage cooler. The spacious master suite features a dressing area, large walk-in closet and en-suite bathroom with deep soaking tub, separate shower and double sink limestone vanity. Large balcony and 2 dedicated parking spaces are included with this offering. Live in the highly coveted, full-service condominium, Silo Point: 24-hour concierge, Fitness Center, and 19th Floor Sky Lounge. Directions: I-95 TO EXIT 55 TOWARDS FT.McHenry/Key Hwy, from the south make left onto Key Hwy, from North make a right onto Key Hwy. At 2nd light turn left onto Lawrence St, turn left on Steuart St. Follow to Entrance Silo Point.